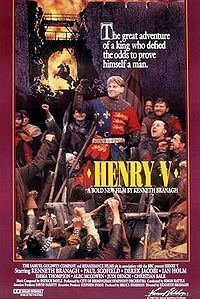 Henry V is a 1989 film directed by Kenneth Branagh, and based upon the Shakespeare play about the famous English King. Branagh stars in the title role with Derek Jacobi as the Chorus (a narrator). Brian Blessed, Ian Holm, Christian Bale, Paul Scofield, Jimmy Yuill and Emma Thompson are among the other stars, whilst Robbie Coltrane and Judi Dench have the cameo roles of Falstaff and Mistress Quickly, both of them major characters in other Shakespearean plays. Another minor character, "Michael Williams", is played by the actor Michael Williams, Judi Dench's husband in real life.